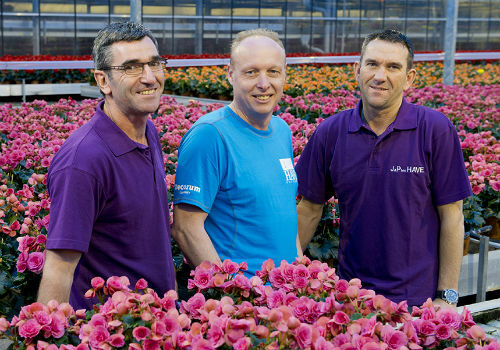 J&P ten Have is a modern potplant nursery specialised in the cultivation of the Begonia. J&P are brothers, Jos and Peter ten Have, they are the joint owners of the company. Gerard van Deventer became part of the management team in 2012. The company has two branches, one at the Herenwerf in Maasland and one at Kreekrug in De Lier. The primary crops are Begonia, Betulia and Gloxinia and as an in-between crop we also grow the Poinsettia. This website will introduce you to the company and the different products in our assortment.